From the very beginnings of our parish in 1907 there were many young boys who attended services of the Liturgy. With time the priests in this parish organized a group of boys into a community that served at the altar at various church services. And this is how the Altar Boy Society started. The most important task of the Altar Boy Society is to put a young boy on the right track, to help him develop as an individual and to be near Christ and His Church. 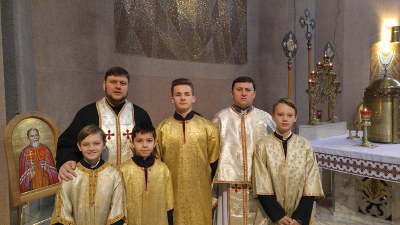 As an Altar Boy, a young person has an opportunity to become acquainted with the essence of Church services and to experience a Divine Liturgy at the altar in the sanctuary from close proximity. This carries a great responsibility and requires much attention – and boys who take part in this develop and grow spiritually. Today the Altar Boy Society includes boys age 7 to 16 whose duty is to serve during Divine Liturgies. There are approximately 10 boys who are now part of this organization.